The Bar, where you can enjoy exotic drinks mixed by our barman in order to get authentic Caribbean tastes. 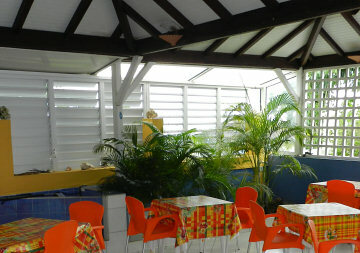 The Restaurant: our Chef proposes refined Creole cuisine presenting colorful Guadeloupean dishes. For the opening days, please ask at your reservation. The terrace: Breakfast buffet is served on the "Terrasse des Caraïbes" offering a wide view over the sea to the surrounding islands of Marie Galante, Dominica, the Saintes as well as to the Soufrière vulcano. 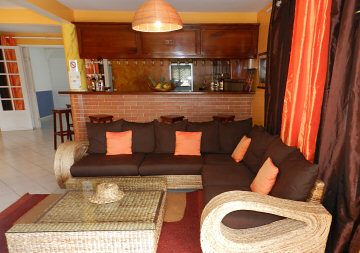 4 rooms with either pool or garden view are situated at this ground floor. The single, double or triple rooms situated here offer either garden, pool or seaview to the neighbouring islands of Marie Galante, Dominica and Saintes. The Junior Suite has seaview as well. 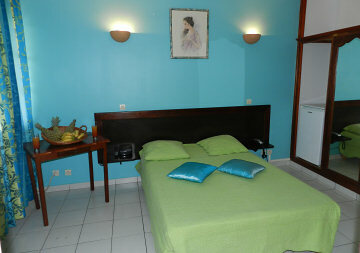 Route de la Plage - Petit-Havre - 97190 Gosier - Guadeloupe - F.W.I.